Got Your Pinch Of Salt Ready? Retailer listings for unreleased games should never really be taken at face value - they're prone to mistakes and errors, and have led to many red faces in the past. 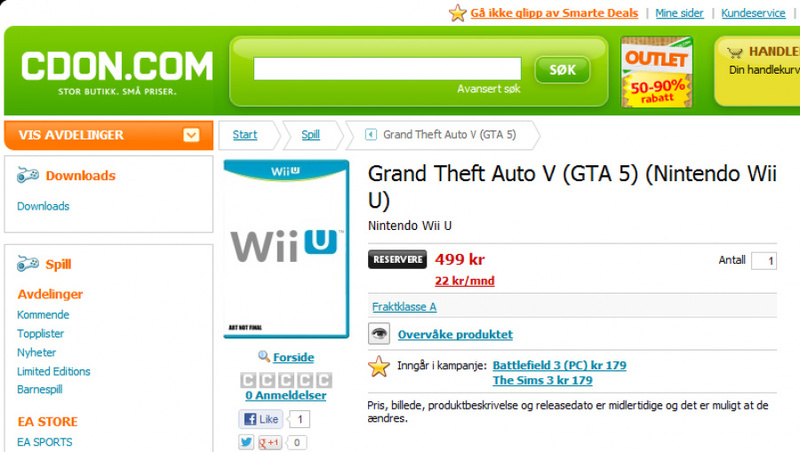 However, there's sometimes an element of truth in them as well, and we imagine that many people are crossing their fingers that this is the case with Swedish retailer CDON's listing for the Wii U version of Grand Theft Auto V.
Given the fact that CDON isn't exactly a well-known force in the field of video game retail, it might be prudent to hold back those feelings of elation, but it's not as unlikely a scenario as you might imagine. First up, Nintendo has relaxed its stance on 'mature' games over the years, and even permitted Rockstar to release GTA: Chinatown Wars on the DS. Secondly, it's highly likely that many third party publishers are eyeing the Wii U with interest, and may have already begun porting over forthcoming games for release on the system. Why? Because they don't want to be caught with their trousers down if Wii U repeats the Wii's success and becomes 2013's hottest ticket. Keep this in the 'rumour' bucket for now, but we personally don't think GTA V on Wii U is as far-fetched as many would have you believe. This is one game I don't see happening, although I really hope I'm wrong. When it comes out I can easily get it for Xbox or ps3, but I'd just love to see Nintendo back at the top with all the big games. As they were in the 90's. If true, i'll no doubt pick up the Wii U version. Providing it releases the same day as the PS3/360 versions. CDON has listet Kirby's Epic Yarn 2 for some time (maybe not know but thay have). I wouldn't get my hopes up, they probably just heard the rumours about GTA V on the Wii U and put it up there just in case. As far as I know (and I know a few people who work for Rockstar North), they don't even have any Wii U dev kits so unless this is being farmed out to another studio i.e. Rockstar Leeds then this is very much doubtful. I don't care for the series much. In fact I hate it. If it does Nintendo good though then all the more power to Nintendo for it. You'll never see this game on my shelf though. I'd rather burn it than even sell it! Yeah, I think its bogus. The only comment i've heard from Rockstar was something along the lines that they weren't targeting the Wii U, because they doubted they'd have an audience on the console. This is probably fake, in-fact I'm sure its fake. That said, it would be a HUGE boost to the platform if R* released this on Wii U, I'm sure its been/being considered. They're probably just looking to get hits on their site. I'm really hoping for a release on WiiU though since it will be a more capable machine and should provide a better experience with the extra screen, even if it's only used for map and maybe sniping. @Angelic_Lapras_King And wii u will be the most powerful conslole when it releases so it would have the best looking version. Hopefully this does come out on Wii u, it'll be interesting to see if they do interesting with the game pad. GTA on nintendo ? welll... i just dont know. but if it ever comes out, idsay its quite promising for the next 2 years for nintendo. then the ps4 will BOOM it with higher-end titles bah, we will see. I wouldn't trust CDON in these things. It has many games listed which no one has even heard of. Did you know that there are games like Kingdom Hearts, Kirby's Epic Yarn 2, Metal Gear Solid, Mii Explore, Doom 4, Fire Emblem, etc. coming to Wii U? That's what CDON says. Not saying that CDON is a bad place. I've ordered games from there and their service works but somehow they list games no one knows about. That is a classic error of people working in a web without knowlegde of what they are doing. That happens in a lot of companies. Later they will get scold and that web will be updated too with the info fixed. @TruenoGT ...Not...true? That's why Nintendo's image is still hindered by it's "kid friendly" perception from consumers. 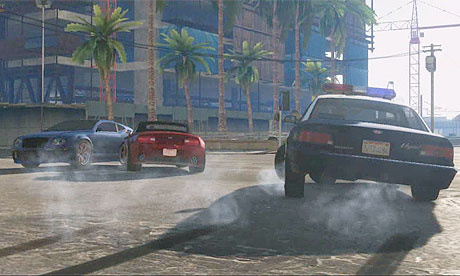 A GTA game will come to Wii U in the future,but I can't see this just yet. This is definately possible. After all this isnt the first time a nintendo system got a GTA game! gta wii u exclusive !!! I think it is more likely than one might think, especially since, as you noted, Chinatown Wars was released on the DS. Having said that, I still take this with a grain of salt. It's on the internet, after all. I hope it does come to wii u. It's a shame we never got a GTA3 port of any kind on the old wii. One of the most fun motion controlled games I played was Godfather: Black Hand. Actually acting out punching a foe, strangling them to near death and throwing them into the path of an oncoming car was far better than a confusing array of buttons. GTA fans would be pleased to know you can also do this to innocent police and women in the game. I was hoping GTA would use the wii wheel and balance board for pedals with an extra wiimote and nunchuk for drive bys and walking. Theyll also add exclusives like buying Super Mushrooms from drug dealers, Stars that will make you invincible to police, and traveling around the city quickly via Warp Pipes. A few months ago, a story was going around that a Wii U GTA V was listed on Rockstar financial sheets. A spokesman said they don't comment about such things, but I don't think it's all that far-fetched (though I don't think CDON knows anything anyone else doesn't). The listings has been taken down now btw. I wouldn't be that surprised if this happens really. After all the hardware limitations are gone now. i really hope it's true... i love grand theft auto! It'd be huge for Nintendo if this is true, and I hope it is. Who even knows if the game will come out on PS3 and Xbox 360, it might be on the next Xbox and PS4. I don't think the idea of it coming out on the Wii U is far fetched. I'd like to see Nintendo make their own GTA type game. Nintendo can do the cutesy games great, they make some of the best games. If a game is made by Nintendo chances are it's going to be good. I don't think anyone would look down on them if they also made "mature" games. I know this is about the game coming out on the WiiU but, I really want to play my own goddamn music for the PS3 version!!! Not a fan of GTA but having at least one game in the series on a Nintendo home console would be nice. It's like having a Mature-rated game would hurt the system. I'd say the next GTA and Read Dead will come to the Wii U. Rockstar poorly supported the Wii, but with the Wii U, the power is there. Even the next LA Noire could be possible. I have always been curious about what GTA is all about I hope it does come to the Wii U so that I may finally see what is so awesome about it. Make it happen, I'll buy it! Honestly, CDON is not at all Swedish, it's Norwegian!! I am also Norwegian and I cannot stand Sweds, much less be mistaken for one!!! GTA 5 will be on the Wii U however, there is nothing stopping this other than Nintendo, and why would they? They won the battle of last generation, with GTA 5 and similar titles, Xbox and PS wouldn't stand a change in the next one.